It’s heating up, even in the Midwest — so to go along with letter W, we pulled out some hands-on water math and science! This has got to be one of most common science experiments for little ones – and why not? They love it. 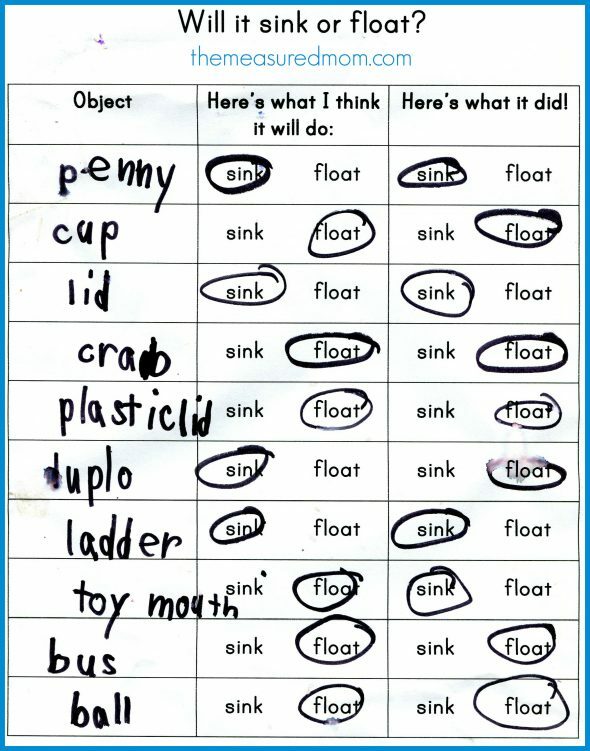 I asked my Six to gather a bunch of objects that might float or sink. Since she had done this experiment in kindergarten during the school year, she was very excited. “I’ll get a penny, Mama! I know they sink.” She was happy to write the names of each object on our recording sheet. The kids took turns choosing an object, predicting whether it would sink or float (which my daughter recorded), and then testing their hypothesis. 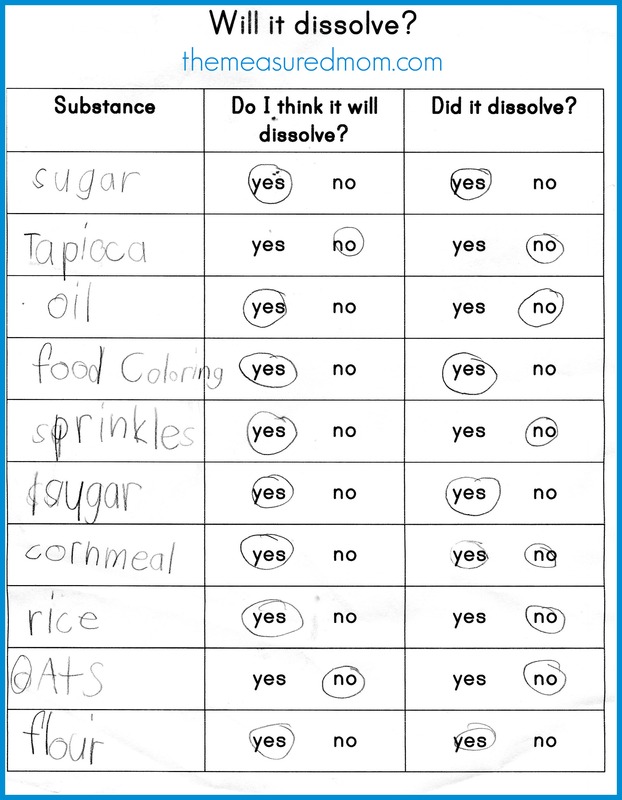 Science: Will it dissolve in water? We raided our pantry for items that might dissolve in water, and the kids had a blast testing each substance in a glass jar. They were fascinated to see that the olive oil actually separated from the water. And I had to convince them that we don’t need to eat soggy sprinkles. For a terrific post about this experiment, visit Hands on As We Grow. Science: Will it absorb or repel water? My Six needed some one-on-one time, so while her brothers were playing together (and not fighting – amazing! ), we took an eye dropper and a pile of objects that could absorb or repel water. 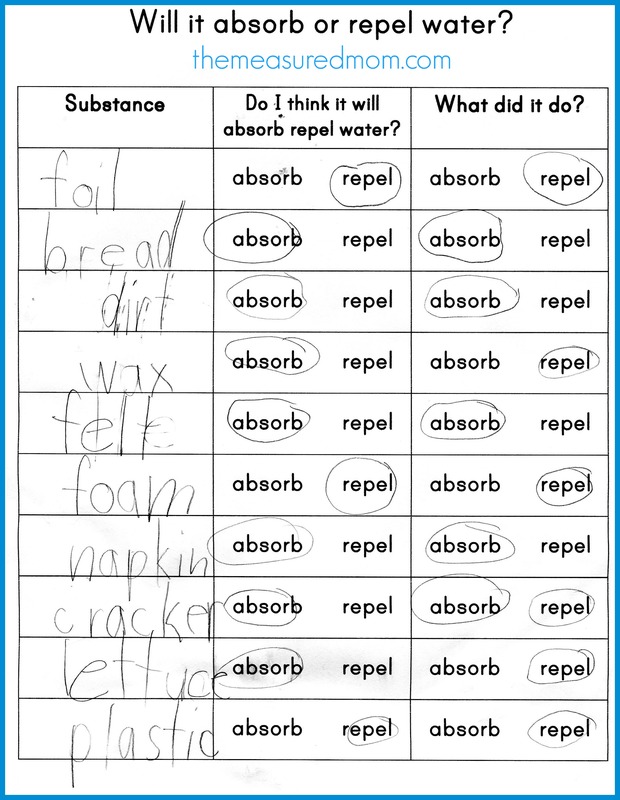 By the end of the experiment I think she had finally learned not to pronounce it “reppel.” 🙂 You can read more about this fun experiment over at Not Just Cute. Science: What happens when different objects soak in water? We found items that might change when left to soak in water for a whole day. 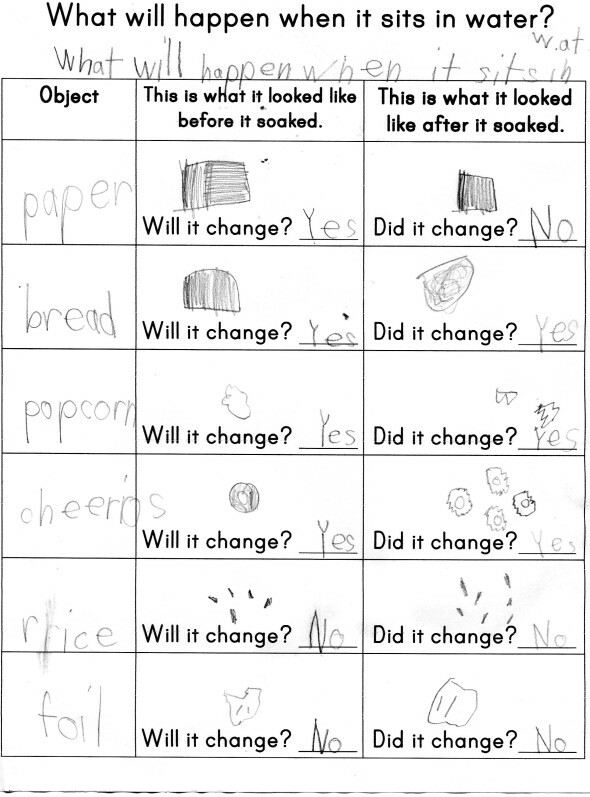 My Six drew a picture of each item before and after it soaked. We were surprised that the construction paper appeared unchanged (besides being wet). 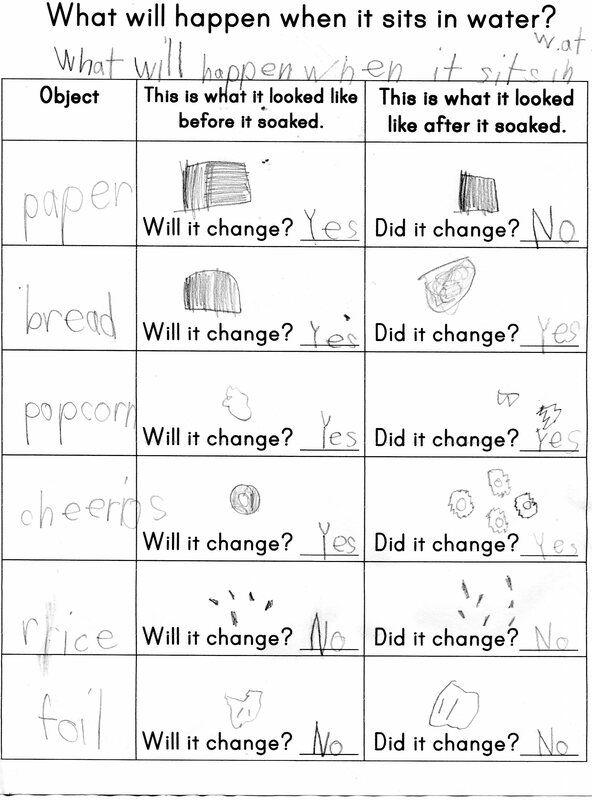 We saw more obvious changes in the bread, Cheerios, and popcorn! The foil and rice looked exactly the same after a 24-hour soak. This idea is from Learn Play Imagine’s fantastic collection of water experiments for kids. As I sat next to the house filling up water balloons during my precious daily quiet time (while the toddler naps and the older kids play by themselves), I wondered if it was worth it. You know how you can spend hours decorating a cake – only to see it devoured in ten minutes? Filling up water balloons feels a lot like that. However, the kids had so much fun doing water balloon math on a hot afternoon – this time it was worth it! I wrote the numbers 1-10 on our sidewalk. I handed my Three balloons with a single number on them; he matched them to the sidewalk numbers and slammed them down. I gave my Four simple addition problems. My Six wanted harder addition problems and a few subtraction ones, too. I adapted this idea from one at No Time for Flashcards. Can water beads count when we’re doing water math? I love this idea from Little Moments to Embrace, where you can learn how she set this up and find many variations. I wrote the numbers 1-6 two times in an egg carton (my Three can’t count groups much higher than that), and he counted the water beads to put in each section. I filled various plastic containers with exactly 2 cups of water each. Then I brought them outside and let the kids add food coloring to each one (they loved this, of course). Next I asked them to tell me which container they thought held the most water. You might have guessed that their top guesses were the cup of blue water and the container of red water – because the water was filled to the top. We took turns pouring the water into the measuring cup. They were surprised to discover that each container held exactly the same amount. How could this be? I taught them the word volume — and together we talked about how a liquid takes the shape of its container. Two containers can hold the same amount of liquid – but it looks different depending on how wide or tall the container is. I think my Six was the only one who soaked up this information! Thanks again for the ideas – btw, how was the vacation ;-)?! 6 more weeks to go until I will enjoy mine, but hubby and daughter are having their time-off right. I will definitely provide them with your ideas to give them more things to do then “cleaning mummy’s car because she made it dirty again”… I love the volume comparison play and learn idea, I am sure my little one will be really excited. It was great, Conny, thanks for asking 🙂 It was really the first vacation since before my oldest was born that felt restful. Helps that we each had our own cabin (actually they were VERY nice log homes) and could spread out. Loved not having a tiny baby too! Have fun trying some of these! 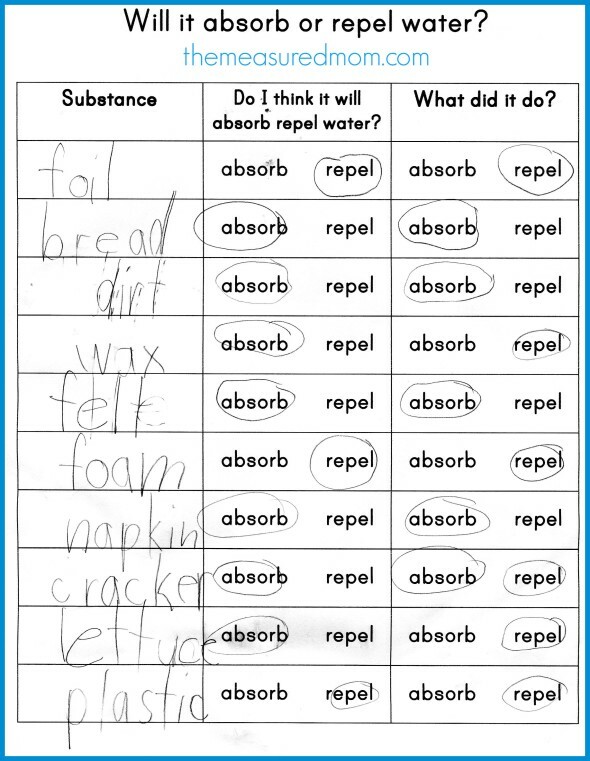 We’ve done sink or float, but I love your “repel or absorb” and your “will it dissolve?” activities. But even more, I love your prediction worksheets! Just fantastic! Hi, Katie! I just checked out your Fireworks Craft and plan to try it out over the next two days!! I’ll let you know how it goes. Thanks for sharing the fun! These are all great for Summer. Thank you for sharing! Thanks, Ruth! It’s always good to get outside learning ideas — sitting at the kitchen table for too long always feels cruel in the summer! Love these ideas. Such fun ways to learn. I would love for you to come link up at Artsy Play Wednesday. Thanks, Kristen! I usually link up at your party but missed it this week. Lots going on over here! We have done several of these, but I love your printables. Pinning for use with my little guy! Oh my gosh. This is great. Love all these activity ideas AND the prediction practice. Thanks, Caroline — what a fantastic ABC birthday party you set up!! 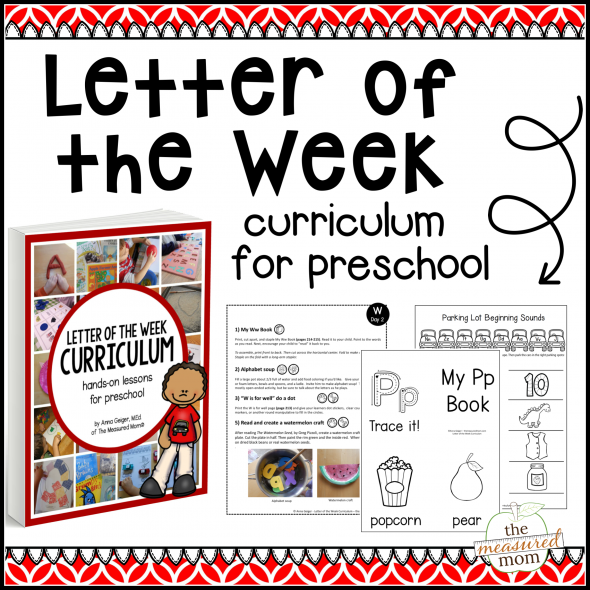 What great activities for preschool! Thanks for linking up with the Tender Moments with Toddlers & Preschoolers Blog Hop! Thank you for stopping by, Dollie! Wow, what a great list of water activities. I can’t wait to try them ALL. My kids love to experiment with water. I pinned this one to my wild science experiments board. Thanks so much for the pin, Jana! I’ve used the sink/float experiment – but I really like your other ideas as well. Some of these activities just might find their way into our school schedule this coming year! Thanks for checking it out, Linda – I hope your family has fun with them! Thanks, Sue! I missed your party this week – it’s crazy busy around here as our garden gets into full swing. Keep reminding me, I’ll get there some time! I love this last experiment on volume – I have to try it with my 6 year old. Visiting from Crafty Moms Share. Yes, Natalie, it really was right on target for my six year old — the concepts too high for her little brothers. I hope you get a chance to try it! What a fun way for kids to explore Science! I shared on pinterest & Google +. Thanks so much for sharing, Beth! I love the printouts you are offering! These are terrific activities. We have done some before and there are some new ones for us to try! I’m so glad you found things you could use, Sarah! I love this! Thanks so much for sharing. I’m definitely pinning this for the future! Oh, what great activities!! I love the comparing volumes one. Thank you for sharing at Sharing Saturday!! Hi! This is a great post, thanks for linking to Tot School Gathering Place! I am looking for the link back and reference to Tot School and I can’t find it in the post, can you direct me to where it is. I am sure I am just missing it, sorry! Thanks for checking it out, Carisa! No, you weren’t missing it, but it’s there now :). Do you have a Tot School button I can add to my link parties list? I wasn’t able to find one – only the “featured” button. WHOA! This list is ideas/activities is awesome! I especially love the comparing volume one. Thanks for sharing this at the After School Linky Party. I’m featuring it tomorrow! Keep the great ideas coming! It was a fun post to write :). Thank you so much for the feature! So many wonderful ideas for learning and playing with Water! Thank you so much for sharing on our After School Linky Party! Here’s the link http://www.theeducatorsspinonit.blogspot.com/2013/07/water-fun-learning-with-kids.html . Can’t wait to see what you share this week! Thank you, Rachel! So thankful for the feature! I am going CRAZY over your site! Love love love every single post. I am starting pre-k at home this fall with my four-year-old and I also have a 2 yr old and a baby. I’m doing Montessori-style and many of your posts fit that style very well. Your printables are so cute and I know they’re going to like these science ideas. I’m so happy to have found you! Thanks so much, Sara! Your comment made my day. 🙂 Especially when I hoped over to your blogs and saw how amazing they are! (New follower here :)) Sounds like your house is a lot like mine wit a bunch of littles. It’s merry and messy, like you say. I hope you keep finding things you can use. Thanks so much for commenting! Ummm, my last post did not come up correctly. I love all the fun ideas on your site. I have posted a link to your site from my science blog. Thanks so much for linking to me! What a great collection of experiments and I LOVE your printable observation sheets! Such a wonderful resource- thanks for linking up to Discover & Explore this week! Thank you, Stephanie! I love the Discover & Explore link up… it’s not often that a link up is hosted by bloggers who all produce amazing content on stunning blogs! Truly an inspiration to the rest of us! Great way to learn math. Good math article.